Great location to walk everywhere in town...except the noise from the main road could be loud. Wonderful breakfast and space provided. Friendly staff. Great place to stay with kids. Staff is awesome and the rooms are what you need for a home base for adventures. Try to get 2nd floor so you don’t hear the people who do get it. Great value in a Moab motel.. Good sized rooms, plenty of 3 queen bed rooms that are great for families and adult friends weekends. Breakfast is on par or above with national chain "free breakfasts". Rooms and beds are clean, new TVs, fridge in each room and microwave. With all the choices in Moab this one holds its own. Great location, amenities and very friendly staff. Bathrooms were dated. Stayed one night with 3 grandchildren and daughter and SIL. Was so nice to have a large room with beds for everyone. Beds and linens were clean, comfortable, and nice. Microwave and fridge were good sized and nice. Little table and 2 chairs also nice. Bathroom was a bit outdated - I think it was the 70's avocado green fixtures - but it was one of the cleanest bathrooms I've ever seen. I didn't care about the outdated fixtures. they were in good working order and as I said before very clean. Breakfast was good, if a little hectic. Had to wait for some items to be refiled, but all items were monitored and refiled timely. They had a selection of breads and pastries, fruit, cold cereals, oatmeal, yogurt, waffle station, and all kinds of breakfast drinks. Wasn't fancy, but did the job. I appreciated the staff. Very friendly and helpful. The kids loved the pool and we spent a few hours enjoying it. Price was very reasonable and I shopped around! We'll be back. It was a pleasant stay. The Lodge was a convenient pickup point for Inner Canyon Tour that took us to the bottom of the Grand Canyon. In addition, it's close to the caverns some might like to explore, and we enjoyed the friendly restaurant. Game room was a nice surprise. Decor was fun and new. Breakfast buffet very neat clean well stocked and satisfying. Loved the fresh berries. Front desk staff very nice, and young boy was very kind offering to make more coffee in the afternoon if it was cold or gone. The only down side is that we were in a downstairs room and could hear every step of the people above us. Way too expenses for a motel with thin walls where you can hear absolutely everything and a rubbish breakfast!. Delicious breakfast. Kids of all ages enjoyed the water slide, pool, and hot tub. Only negative was traffic noise. Continental breakfast was great with a large variety of options such as yogurt with fresh fruit. Some items such as bottled water were available all day. The hotel staff were very nice and accommodating. They allowed me to check out 3 hours late since I wanted to be able to shower before hitting the road after a guided tour at Arches. Overall, the room was clean and looked exactly like the photos posted. Excellent hotel within walking distance from the Main Street where all the souvenir shops were. Really enjoyed centralized location, staff and layout. Thought night traffic noise would be a problem, but was ok. Enjoyed our stay. Everything was very nice and convenient to the national park. We had a lovely overnight stay before our Arches visit. The pool slide and arcade were "so cool" (says 6-year-old). Dinner was a short walk away, and dessert was a stroll back with ice cream. Loved the updated room. Water was free - who gives out free water to their guests anymore? Staff friendly. Breakfast well stocked. had a great time. Friendly front desk staff, love the free play arcade and ping pong table. Juice and some breakfast items available 24/7. Beds were comfy and room was clean and trendy! We have 8 kids. We rented a room with 4 queen beds in the form of 2 bunkbeds. It was affordable and nice not to rent two rooms. All slept well except one daughter that said the bed was uncomfortable. Pool with waterslide and hottub nice. Floor showed some dirt when we returned with wet feet from the pool but probably smarter than having wet carpet. No breakfast so we brought coupons for burger King from home. Only one bathroom/shower must be considered with this option. 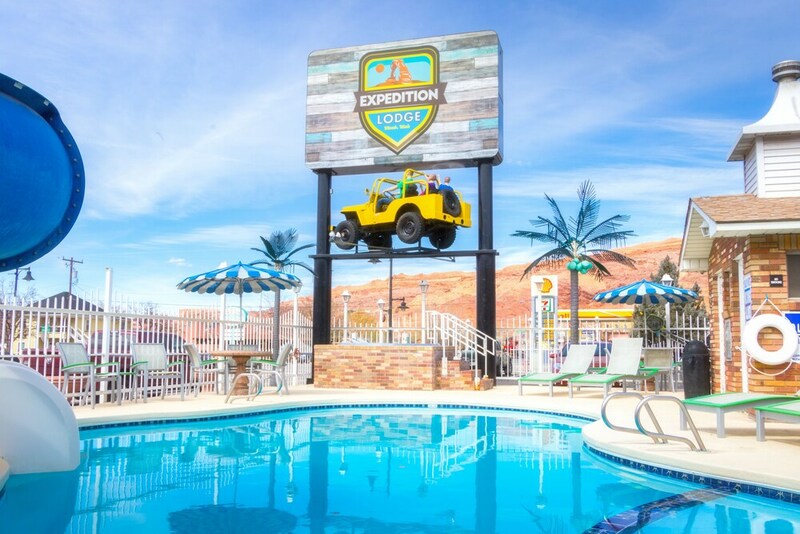 Located within a 5-minute walk of Swanny City Park, Expedition Lodge is within a 15-minute stroll of Moab Information Center. This motel has 36 rooms and welcomes guests with conveniences like free breakfast, an outdoor pool, and free in-room WiFi. Free continental breakfast is included with your stay and awaits you each morning from 6 AM to 10 AM. A flat-screen TV comes with satellite channels, and guests can stay connected with free WiFi. Beds are dressed in premium bedding and the bathroom offers a soaking tub, a hair dryer, and free toiletries. Other standard amenities include a refrigerator, a microwave, and a coffee maker. Guests staying at Expedition Lodge enjoy an outdoor pool, a children's pool, and a spa tub. You can take advantage of free parking if you drive. Front-desk staff are standing by 24/7 to assist with any requests. Other amenities at this family-friendly motel include free WiFi in public areas, coffee/tea in a common area, and an arcade/game room. Thank you for the review. Glad you enjoyed your stay. Hope to have you back again. Thank you for the kind words. Glad you enjoyed our little place and town. The traffic can get loud at times with Moab being on the Main highway. If your even in the area again please reach out we would love to have you back. Thank you Lawrence for the review! We are pleased to hear you enjoyed your stay with us! Come back and visit us next time! Thank you for the review, glad you enjoyed your stay. Thank you, RR, for the review. We are happy to hear that you enjoyed staying with us. The pool is usually a hit with kids, so its nice to hear that they enjoyed it. The motel has an outdoor pool, a children's pool, and a spa tub. Other recreation options include a waterslide.